SAN DIEGO, Aug. 21, 2018 /PRNewswire/ -- The San Diego Half Marathon and the San Diego Padres are joining forces to present the 8th Annual San Diego Half Marathon & Padres 5K at Petco Park on Sunday, March 10, 2019. The races return with their signature "epic" finish inside Petco Park, which will have free admission and open seating to the public. Other distances include a two-person half marathon relay and kids race making this a truly family-friendly event complete with post-race festivities in Park at the Park and special offers from local eateries. San Diego Half Marathon & Padres 5K at Petco Park on Sunday, March 10, 2019. Register at sdhalfmarathon.com. "We are excited to work with the Padres more closely to offer the running community an even better race experience," says Susan Briggs, Executive Director of the local nonprofit running organization. "We want to continually improve to present a truly unique event where runners can enjoy the best of our city and our beautiful ballpark." San Diego Half Marathon and the Padres have a three-year agreement which will provide new and legacy runners the thrill of a stadium finish through 2021. "We are pleased to continue our partnership with the San Diego Half Marathon and its support for local charities," says Erik Greupner, Padres' Chief Operating Officer. "Petco Park was built to be enjoyed by San Diegans and our guests year-round. 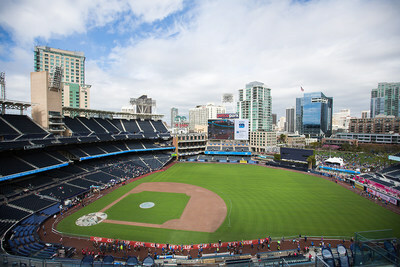 Special events like the San Diego Half Marathon showcase the ballpark in an amazing way and allow runners and their supporters to have a unique and memorable experience on the field." Both the half marathon and 5K races are USATF-certified, start on palm tree-lined Harbor Drive, and end running through the tunnel to finish inside Petco Park's third base warning track. Spectators also can watch their loved ones cross the line on the Petco Park jumbotron, creating a great video opportunity and a truly epic finish. All finishers will receive a collectible medal and half marathon, relay, and 5K participants receive premium perks including a technical running shirt, post-race tote, live runner tracking, a ticket to a select San Diego Padres baseball game, and a Padres player bobblehead. Online registration is now open at sdhalfmarathon.com and runners can take advantage of lower registration prices by signing up before the next price increase on September 8, 2018. The San Diego Half Marathon is made possible by our generous sponsors. To learn more about sponsorship opportunities, please email sponsorships@sdhalfmarathon.com. The San Diego Half Marathon is a premier, one-of-a-kind race and event that celebrate the beauty and uniqueness of the city of San Diego while raising money to help local community charities. The organization is a nonprofit 501(c)(3) with all net proceeds benefiting community service projects and select charitable causes in San Diego. The event also seeks to catalyze volunteerism as a way to build community spirit and boost neighborhoods in need of support. In addition to the funds raised for various charities by the runners themselves, the San Diego Half Marathon has successfully raised and donated more than $350,000 for various community service projects since 2012. For more information and to register, please visit San Diego Half Marathon.